It was a busy end of term with the report cards and awards. The children were very proud to receive their certificates and badges, and so they should be as they were all very well deserved. Remember that we do not offer certificates and badges for sale at the end of the Autumn term as we have found in the past that it is all a little too much for the children after a break and starting back at school. However the children will be assessed to keep track of their progress and formally assessed in the Spring term starting in January. We said goodbye to a few children who either couldn’t make the classes we were offering :( or had just reached the time when they were finished with our club so wish them all well and good luck for the future. As you know we said a very sad goodbye to Rupert (Instructure Marlow Saturday) who had been with us for some time both as a Life Guard and an Instructor. Rupert used to live in Marlow but his family have now moved to London and Rupert has gone off to University. Eddie has now taken over his slot on a Saturday and all his lessons I am very pleased to say went fine on the first Saturday of the new term! For those of you that have been on poolside you may have noticed our bright new T Shirts we are all wearing. A couple of reasons for this colour choice, one being that they are really bright! The other being that a few years ago we were externally assessed by an independent assessor from the Swimming Teachers Association on all aspects of running a swim school and one of the few points that was raised was that all poolside and teaching staff should be identifiable at all times. We always wore yellow on poolside and white in the water but in ‘electric yellow’ you really couldn’t be missed!! Also it will brighten up any dull winter days that may be ahead……. 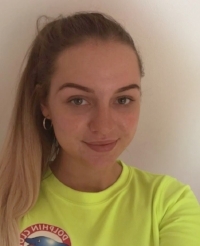 We are also delighted that Mollie has joined to us teach at our Stoke Park Club venue. 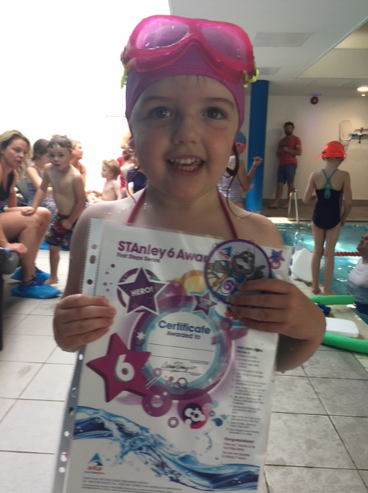 Finally I wanted to share this picture of lovely Sophie with Alfie and Harry, this picture sums up Dolphin Swimming Club and what we are all about! !